We’ve been looking forward to making S’mores today but Mother Nature delivered us a cool, rainy day. Instead of calling it a bust, we decided to make a version of S’mores in the oven which Isabelle has named “Marshmallow Chocolate Split.” Next time you have a craving for S’mores and the weather doesn’t work out, try out this easy recipe. Line a 13x9 baking pan with foil leaving a 1 inch overhand on each end. Spray foil with cooking spray. Line graham crackers up on foil so that ends touch. Melt butter and brown sugar in a saucepan over medium heat. Stir constantly until mixture is smooth and comes to a boil. Approx. 5 minutes. Spread butter/sugar mixture evenly over crackers. Bake 9-12 minutes or until bubbly. Remove pan from oven. 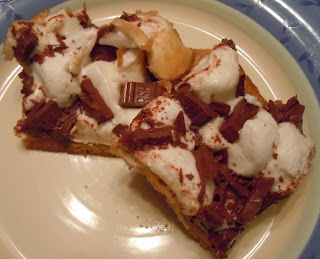 Sprinkle with marshmallows and chocolate. Continue to bake until marshmallows begin to soften, approx. 2-3 minutes. Cool completely before lifting bars from pan using foil. Cut in to bars, eat, and enter a sugar coma. You can also use colored marshmallows/candies around different seasons to make it more festive. This dessert is really sweet so you could also try out a semi-sweet chocolate or dark chocolate if that’s more your style. For me, the sweeter the better! Join Me For a #LatteLove Twitter Party! Have You Cleaned Your Rings Lately?